One of the holiest sites for Jews is the building on Mount Zion known as the Tomb of King David — the celebrated Old Testament warrior king of Israel who is traditionally credited with composing many of the Psalms. The Old Testament clearly indicates that David was buried somewhere else. However, the site — directly underneath the Cenacle, where Christians commemorate the Last Supper — remains a place of pilgrimage for Jews, Muslims and Christians. Archaeologists have shown that the City of David, also called Zion (or Sion), was the low spur south of the Temple Mount and east of the present Mount Zion. This area, also known as Ophel, is now known to have been the original Jerusalem — making it much older than what is now called the Old City. How did the confusion over David’s burial place arise? There are two likely reasons. • First, perhaps at the time Solomon built his Temple, the Temple Mount came to be called Mount Zion. In the first century AD, following the Roman destruction of Jerusalem, the name was transferred to its present location across the Tyropoeon Valley. Until excavations in the 19th century, archaeologists believed that the city of David was on this hill too. 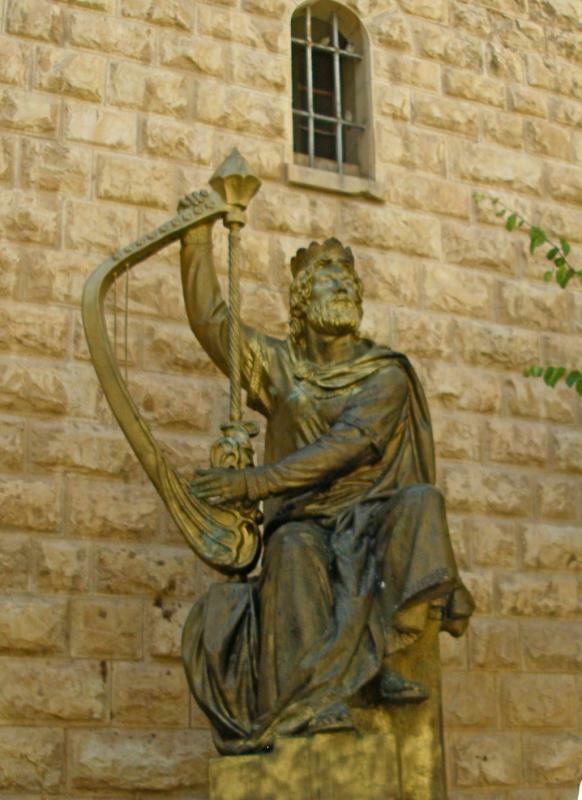 • In the 10th century a belief that David’s tomb was on the present Mount Zion began to develop among Christian pilgrims, who celebrated David’s memory along with that of St James, the first bishop of Jerusalem. It was actually the Christian Crusaders who built the present Tomb of David with its large stone cenotaph. However, three of the walls of the room where the cenotaph stands are much older — apparently from a synagogue-church used by first-century Judaeo-Christians, which became known as the Church of the Apostles. Gradually this memorial came to be accepted as David’s tomb, first by the Jews and later also by Muslims. Entry to the Tomb of David is through a courtyard which is part of a former Franciscan monastery that was closed in 1551. The complex has three simple rooms, all without furniture except for wooden benches. The entrance hall is used as a synagogue. There is a Christian tradition that this is where Christ washed his disciples’ feet during the Last Supper. The massive cenotaph stands in front of a niche blackened by pilgrims’ candles. Over it is draped a velvet cloth with embroidered stars of David and inscriptions from the Jewish Scriptures. On it are scrolls of the Torah (the first five books of the Hebrew Bible) in ornate cases. The cenotaph is an empty sarcophagus. In 1859 an Italian engineer, Ermete Pierotti, investigated the tomb and reported that underneath was a small, shallow and empty cave. The Tomb of David was of special significance to Jews between 1948, when the state of Israel was founded, and 1967. During this period the Old City was under Jordanian control and there was no access to the Western Wall of the Temple Mount. 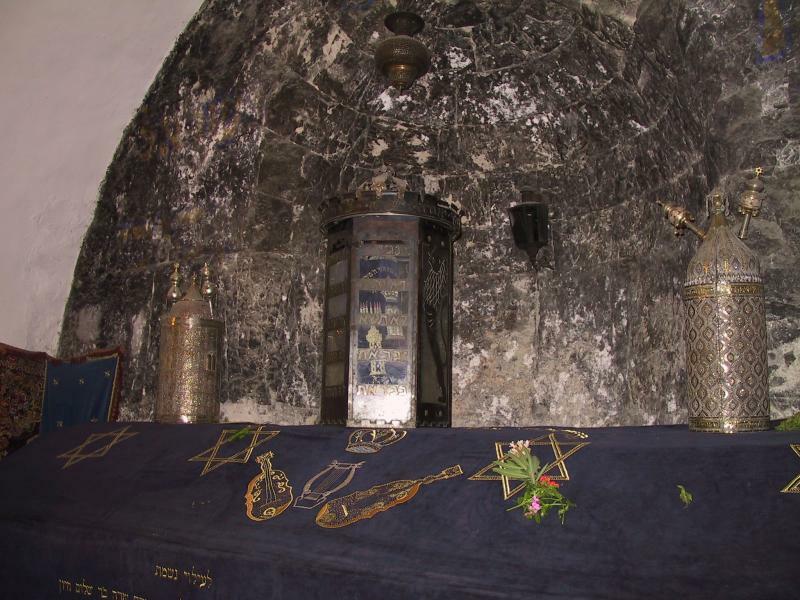 Since Mount Zion was in Israeli control, Jews would come to the Tomb of David to pray. Open: 8am-sunset (closes on Fridays at 2pm Apr-Sep and 1pm Oct-Mar). Men and women are separated. Men should cover their heads (kippahs are provided).